Making support simple makes your business work better. Roving features convenient, responsive user support. With advanced cloud-based technology for mobile workforce management. Our cloud-based approach ensures that every user enjoys prompt access to software features and automatic updates. No other hoteling software solution compares. Receive prompt, professional support, report a problem or suggest new features by emailing our team. Our Zendesk™ support system ensures that Roving users receive fast, reliable technical support. Short response times and dedicated client support specialists keep your organization operating at peak performance. Roving has already helped many businesses with inventory reservation and mobile workforce management. Read more to find the solution you need. Q. Can I set recurring meetings/reservations? A. Recurring room reservations work much the same as regular reservations. When placing a room reservation, the user simply has to flip the "Recurring?" switch ON. This allows them to choose Daily, Weekly, or Monthly recurrence. Up to one year of recurrence is supported for each reservation. Q. Are Out-of-Office reservations handled separately from my other reservations? A. Out-of-Office reservations are handled just like any other reservation. Users add Out-of-Office time directly on to their calendar. Out-of-Office acts like another office location where a user can place reservations, it simply doesn't have an associated physical location. Q. Will reserving a morning as Out-of-Office remove all my reservations for the day? A. Out-of-Office reservations can be placed by the hour or by day. These reservations do not overwrite or supersede any previous reservations of space or assets. Q. Which browsers are compatible with Roving? A. Roving is compatible with all modern Web browsers (Chrome, Firefox, IE10+) and most mobile browsers. This allows users and administrators to access resource calendars, inventory reservations and all features from anywhere. Q. Can I use Roving on my mobile device? A. Roving works on the Web browser of most Android, iPhone and tablet devices. It is optimized to automatically adjust to the mobile environment, so tracking resources and room reservations is truly mobile. Q. How does Roving integrate with Microsoft Office? A. Roving Calendars and Space Reservations are integrated with Outlook Calendars. A space request can be made and reserved directly from an Outlook Meeting Request or Appointment by using our MS Office add-in. For specific integration questions, contact us. Q. How do the email notifications work? Are they easy to configure? A. Email notifications are built into Roving so users are reminded about their activity. Reservation notifications are automatically sent to users who have not placed reservations in over one week or in over one month. Users do have the option to opt in or opt out of email notifications. This is configured on their respective user page. Q. How are multiple time zones handled? A. When making a reservation, the target location timezone always takes precedence. If a user places a reservation for an office or asset in London, then that reservation observes the local time zone. Reservations are also viewable in the User Calendar. These reservations adhere to the reserved location time zone. For example, if a user in Australia places a conference room reservation for Saturday afternoon in Singapore, the reservation will appear on their calendar for the Singapore meeting time. Q. How are new users created with OpenID? A. OpenID allows for authentication of a pre-entered list of users with verified outside providers (Google, Active Directory, etc.). When a new user attempts to log in, their credentials are verified against one of these accounts. If the credentials are good, the provider sends Roving the necessary information to populate this user information. The new user is now created and authenticated. Q. How easy is it to add/remove offices? A. 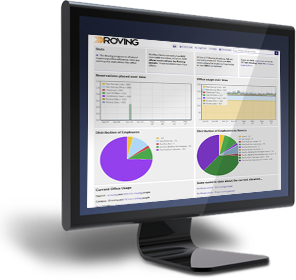 The Roving Admin Panel is where administrators configure various aspects of Roving, including adding and removing offices, adding and removing inventory and viewing usage statistics. To add an office, simply provide the name of the new office and click "Create". The new office can then be edited like any existing office. Removing offices is just as easy – simply flip the "Active" switch on the "Edit Office" page to deactivate. Q. Does Roving support multiple floors/non-traditional building designs? A. Additional floors are easily added to an existing office via the "Edit Office" page. In addition, Roving includes a built-in map editor which allows administrators to fully configure their Roving locations to suit any non-traditional location, making conference rooms and shared workspace reservations simple.